Get Your Grill On with The Ultimate Panini Press Cookbook | Breezy Mama Breezy Mama - Expert parenting advice, celebrity interviews, product reviews for kids, moms and babies and more! I am a huge sucker for grilled cheese sandwiches. Gooey, ooey and completely blissful, I love one on a cold day with a bowl of hot tomato soup. So when one of Breezy Mama‘s favorite bloggers, Kathy Strahs of Panini Happy, asked if I wanted to test out some recipes for her upcoming The Ultimate Panini Press Cookbook, I knew I was going to be in for a good treat. Granted, just because a sandwich is coming off a panini press doesn’t make it a grilled cheese, but I knew that cheese would mostly likely be involved, so I was in. Kathy sent me the recipes that she wanted me to test, and boy, did they not disappoint. She must’ve been reading my mind, because I tested out paninis with names like Pepperoni Pizza Panini and Grilled Colby and Onion–right up my alley. Fast forward one year (almost to the day! 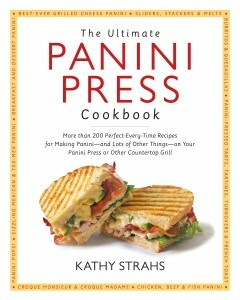 ), and Kathy’s recipes are now available not just for testers, but for the mass market, in her new cookbook The Ultimate Panini Press Cookbook. Chock full of yummy tastings and gorgeous photography (all taken by her! ), this book will have your mouth watering by page 5. With everything from panini sandwiches, to grilled meats, to desserts (Ice cream cones! On a panini! ), this cookbook is truly inspirational and easy to follow, so everyone from the novice cook to the advanced chef will enjoy it. With tips on what makes the best bread, to how to cook vegetables, to buying a panini press, the result is a no-fail meal. And the best news, you don’t have to own a panini press to create the recipes–a George Foreman Grill works just as well. Click here to get your copy of The Ultimate Panini Press Cookbook ($13.86) — Happy Panini-ing! For any Breezy Mama readers who would to have their book autographed (great for gifts! ), you can just submit a request to Kathy at http://www.paninihappy.com/bookplate. How cool is that? !